This stainless steel conveyor is equipped with washdown rated motors, drives, and supports making it perfect for transporting dirty or oily parts or scrap material. The example model shown has an incline of 35 degrees and infeed and discharge heights of 24" and 92" respectively. Call us for more info on other sizes and customization. Live Load Cap. : 175 lbs. All frame components are made from stainless steel including bed, side frames, spreaders, fasteners, take-up frames & adjusters, side skirts, brackets and all guards. Wash down motor, reducer, chain, sprockets, keys, fasteners, rod ends & threaded rod (if shaft mounted reducer). Includes stainless legs, knee braces, mounting brackets, fasteners & feet. 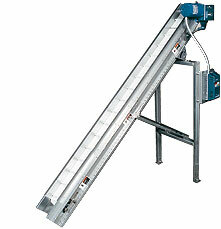 Welded 3" side skirts keeps material from overflowing the sides of the conveyor. This feature reduces the amount of material allowed to migrate to the chain and tracks, which causes increased wear.